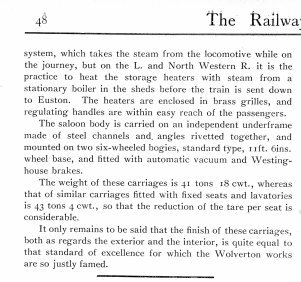 system, which takes team from the locomotive while on the journey, but on the L and North Western R it is the practice to heat the storage heaters with steam from astationary boiler in the sheds before the train is sent down to Euston. The heaters are enclosed in brass grilles, and regulating handles are within easy reach of the passengers. The saloon body is carried on an independent underframe made of steel channels and angles rivited together, and mounted on two six-wheeled bogies, standard type, 11 ft 6 ins wheel base, and fitted with automatic vacuum and Westinghouse brakes. The weight of these carriages is 41 tons 18 cwt., whereas that of similar carriages fitted with fixed seats and lavatories is 43 tons 4 cwt, so that the reduction of the tare per seat is considerable. It only remains to be said that the finish of these carriages, both as regards the exterior and the interior, is quite equal to that standatd of excellence for which the Wolverton works are so justly famed. Sourced by: David Winter, courtesy Manchester Libraries. Transcribed by: Michael Fearn, March 2010.